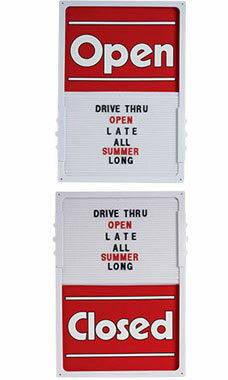 The Vertical Sliding Open/Closed Sign Board with White Frame not only notifies customers that your business is open or closed, but also lets them know your hours of operation. The open/closed sign comes with 360 Helvetica font letters, numbers, punctuations, and symbols to fully customize your message. The sign measures 14”W x 20”H and easily attaches to any window via suction cup. Plenty of info for your customers on one sign. Easy to set up and use! This product was a very good value for the price paid for it. Had more than enough letters and numbers included to make a good presentation on the board. Construction quality leaves a little to be desired. Works perfect for our needs. Thanks for the candy! Great value for this product. Product originally arrived damaged. Called customer service and they replaced it no question asked!! Great customer service. Thank you.